Have you ever wondered how the animojis on the iPhone X work? Don’t worry, deep learning has the answer again. How about a technique that doesn’t require any specific hardware, doesn’t need a video of you (just a picture), and generates a 3D digital avatar with remarkable accuracy that can be animated in real time? This is not some far-off futuristic technology. This is now. A group of developers have released a research paper demonstrating how they used deep learning to build a digital 3D avatar of a person’s head and face. The input image is segmented into a face part and a hair part. Then, the har part is run through a neural network that attempts to extract attributes like length, curve, spikiness, baldness, etc. This is an extremely deep neural network with over 50 layers. 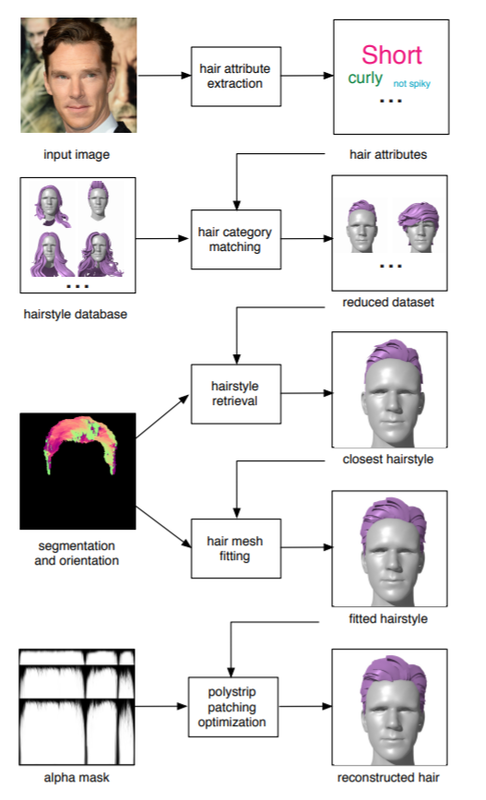 It was trained on over 40,000 images of various hairstyles. The framework is also robust to lighting. That is, even under differing light conditions, the same photo will lead to extremely similar outcomes. And the same applies to facial expressions. The developers claim that their digitized models are fully rigged with intuitive animation controls, like blend shapes and joint-based skeletons, and can be readily integrated into existing game engines. To see the technology live in action, you can also download the PinScreen application on iOS devices (not available on Android currently). Their model offers a practical end-to-end solution for avatar personalization in gaming and VR applications. I have previously used a similar application wherein we hosted avatars in virtual classrooms so people could connect from remote locations. But with the level of personalization this deep learning model offers, it could be a game changer in multiple industries. As a person on the video has commented, it is amazing how machine learning is making hardware obsolete. From 3D face scanners to dual lenses (as we covered in the Pixel 2 article), hardware is just not a necessary component when algorithms are as intelligent as this one. I strongly recommend checking out their research paper to understand how they went about building the deep neural network and then trying it on your own. Wher is the source link? The link to the research paper id provided in the post itself. You can also refer the video provided above.